Morning Motivation — When traveling conditions change, do you want to stop? When traveling conditions change, do you want to stop? Just because the road gets rocky, the streets get slippery, the traveling conditions get tough don’t stop your journey. Keep going! Turn up the heat. Get out the chains for your tires. Weather the storm. Even though it feels like the trail has gone cold or the path is too difficult it’s only temporary. Like the seasons, things will change. They will get smoother. You will feel more grounded. The trip will become easier. Regardless of what the road ahead throws at you, don’t give up. 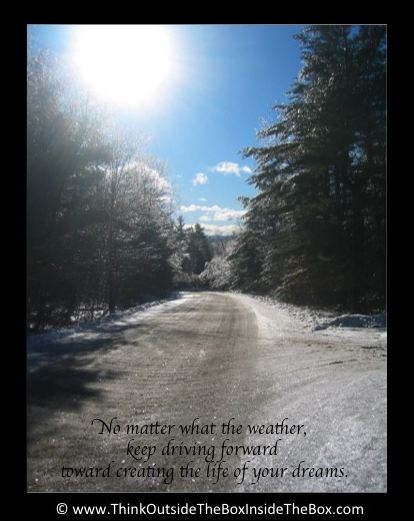 No matter what the weather, keep pushing forward toward creating the life of your dreams.